In low- and middle-income countries (LMICs), economic advancement is linked to a health transition that shifts from infectious diseases to non-communicable diseases (NCDs). Most NCDs are from lifestyle choices and behaviors that lead to changes in the national public health sphere as the overall burden of disease moves from infections spread directly or indirectly from one person to another. For example, malaria, TB, HIV, hepatitis, respiratory and diarrheal diseases fall into this category. However, NCDs include health conditions such as hypertension, some cancers, obesity, diabetes (type II), and cardiovascular diseases. See our infographic here. The World Health Organization reports that NCDs are “driven by forces that include rapid unplanned urbanization, globalization of unhealthy lifestyles and population ageing” and lead to 70 percent of the world’s deaths. Islam et al. predicts that number will be closer to 80 percent by 2020.
Who bears the burden of deaths from NCDs? The NCD Alliance and the Task Force on Women and Non-Communicable Diseases estimates that NCDs kill 35 million people each year. Of those deaths, about half of them – or 18 million – are women in their reproductive years. As NCDs can lead to complications during pregnancy and childbirth, they are inextricably linked to maternal and newborn health outcomes. For example, low-calcium diets, obesity, diabetes, and general hypertension put women and girls at higher risk of developing pre-eclampsia and eclampsia (PE/E) – life-threatening, high blood pressure and excess protein in the urine after 20 weeks gestation. 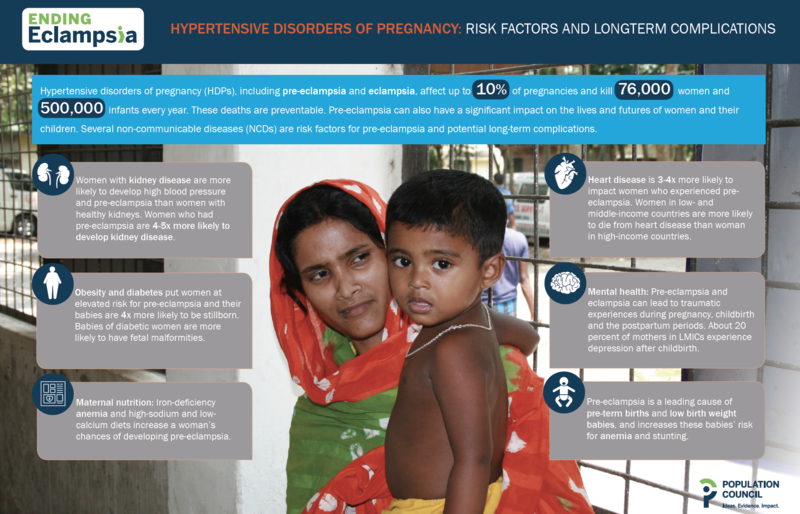 PE/E is the second leading cause of maternal mortality, and most often occurs during the second half of pregnancy, but can happen before, during, or after delivery. It can lead to seizures, kidney and liver damage, and death. Globally, a woman who experiences pre-eclampsia or eclampsia (PE/E) – has a higher risk for placental abruption, for developing it again in future pregnancies, and she is 3 – 4 times more likely to develop diabetes and cardiovascular disease later in life. Her baby is at risk of being born premature or with low birth weight. So, what can be done to reduce the risk women and girls increasingly face? Since poor nutrition is a risk factor for many NCDs – obesity and its associated autoimmune disorders (diabetes, thyroid disorders, and hypertension) – advocacy for well-balanced food intake should be at the forefront of health initiatives. For example, nutrition growth monitoring programs for children and nutritional supplementation programs (iron or calcium supplementation and iodine fortification) can be expanded to include adolescents, or programs that provide free meals could share information on proper nutrition for women and babies. If providers at all levels were allowed to prescribe aspirin and calcium supplements to women at risk of developing pre-eclampsia and eclampsia, and to administer antihypertensive drugs and magnesium sulphate to prevent and manage PE/E, there would be fewer PE/E-related preventable deaths. In May at the Global Health Assembly, Women Deliver, deliver for GOOD, the NCD Alliance, and Scaling Up Nutrition hosted “Fueling Action: Leveraging Policy and Advocacy to Address the Rising Toll of Diabetes in Pregnancy.” Panelists suggested several additional policy recommendations that include mandating exercise for girls in school, implementing a sugar tax, and limiting access to sugary drinks. Watch the discussion here. Adolescent girls and women in LMICs need life cycle initiatives that reach them at points in their lives other than during pregnancy or when they are trying to prevent it. The knowledge and health behaviors they will gain will shape their futures, form their diets and what they feed their families, and impact the overall health and burdens of disease of future generations – a win-win for women and their babies.